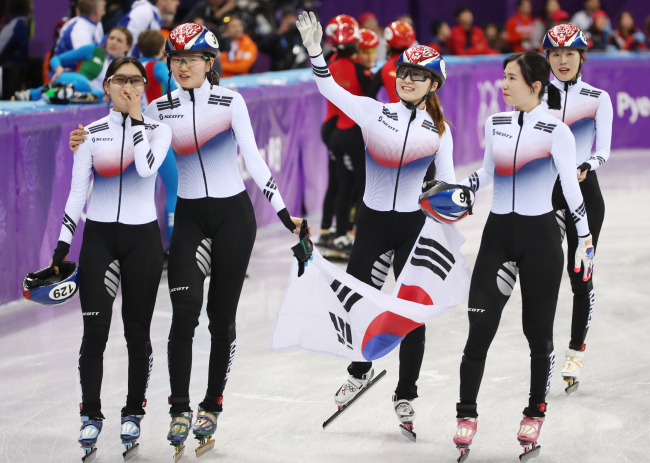 South Korea won the gold medal in the women’s 3,000 meters short track speedskating relay finals on Tuesday. Shim Suk-hee, Choi Min-jeong, Kim A-lang and Kim Ye-jin competed in the women’s 3,000 finals against the Chinese, Italian and Canadian teams at Gangneung Ice Arena in Gangneung, one of two cities in Gangwon Province hosting the Winter Games. Choi, already a gold medalist in the women’s 1,500 meters on Saturday, finished the race in 4:07.361, closely trailed by China’s Qu Chunyu. The Italians, who collided with the Canadians and fell, came in third at 4:15.901. However, with China and Canada receiving penalties, Italy moved from bronze to take silver and the Netherlands moved from the fourth to take bronze. Shim, Choi and Kim A-lang participated in the women’s 1,000-meter heat events on the same day, all of them finishing first in their heats. They will not race against each other in the quarterfinals on Thursday. The women’s short track relay has been among South Korea’s most consistent medal events. South Korea came in the defending champions, and had nabbed five out of seven titles from 1992 Albertville to 2014 Sochi. In the first women’s 3,000-meter short track heat on Feb. 10, South Korea finished at the top with an Olympic record of four minutes, 6.387 seconds, despite a spill early on. Before the women’s competition, South Korean men’s speedskaters Seo Yi-ra, Lim Hyojun and Hwang Dae-jeon also began their quests for gold in the men’s 500-meter heats, all topping their races with comfortable leads. Seo crossed the finish line in 40.438 seconds in the third heat, while Lim -- the 1,500 meters gold medalist already this year -- finished in 40.418 seconds. Hwang, in heat No. 7, recorded 40.76 seconds.